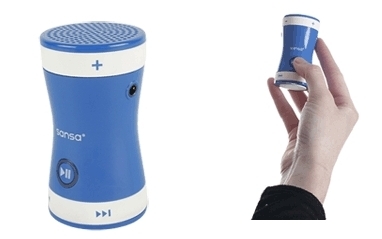 Ever seen a salt-shaker that can play songs? California based flash memory card producers, SanDisk Corporation, modifies the concept of a salt-shaker to produce a simple, kid-friendly and funny salt-shaker-shaped MP3 player. 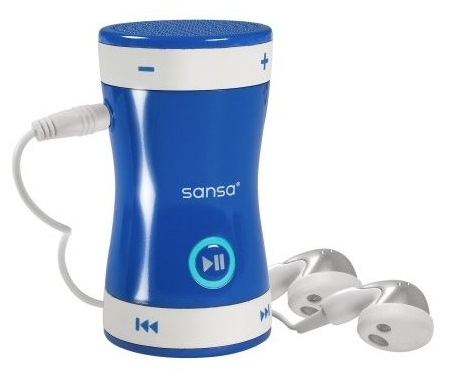 This salt-shaker-shaped MP3 player comes with a lanyard, a USB cable and one 512CD card. It is compatible with MP3 or WAV files only. It has two headphone jacks and an onboard speaker. Users can listen to their favourite songs via headphone or through the speakers. Of course you can physically shake the player while listening and interacting with the music. But you need to be careful as you might accidentally press the pause button. You can also scroll your playlist by twisting the base and turn the top to adjust the volume. It is fun but the flap covering the bottom might not be durable over time if it is frequently used. One major inconvenience of this MP3 player is the lack of rechargeable battery. You need to unscrew the bottom to replace the battery after a few hours’ playtime. Note: Gene sent by email to say that you must actually press the Pause button when giving the Shaker a quick shake in order to jump to another track.